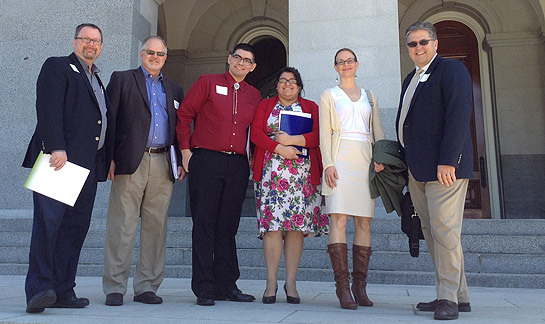 SACRAMENTO, Calif. - Simpson University students and administrators recently spoke to state officials about the importance of Cal Grant funding during the Association of Independent California Colleges and Universities (AICCU)’s annual Day in the Capitol. Students Elizabeth Haase and Zachary Sanchez visited the offices of state Sens. Jim Nielsen, Ted Gaines, Lois Wolk, and Connie Leyva; and state Reps. Freddie Rodriguez, Beth Gaines, Bill Dodds, and James Gallagher during the Feb. 24 event. The students were joined by Simpson University Interim President Robin Dummer; Brad Williams, executive vice president; Dr. Tom Shaw, vice president for enrollment management; Dr. Cherry McCabe, political science professor; and Melissa Hudson, director of student financial services. For the past three years, Cal Grant funding for students attending private, non-profit colleges and universities has been targeted for potential cuts by the state legislature. Nearly half of Simpson’s traditional undergraduate California students receive Cal Grants. Elizabeth Haase is a senior from Red Bluff majoring in cross-cultural studies with a political science minor. Zachary Sanchez, a sophomore from Azusa, Calif., is working on a double major in history and Spanish, along with a pre-law concentration. Photo by Cherry McCabe / From left, Dr. Robin Dummer, Brad Williams, Zachary Sanchez, Elizabeth Haase, Melissa Hudson, and Dr. Tom Shaw visit the state Capitol in February to talk to officials about Cal Grant funding.